An 11-year old boy named Sascha living in Saskatchewan, Canada, received a very special delivery today of an Autism Service Dog from Service Dogs by Warren Retrievers. Regina, Canada, August 24, 2018 — Sascha, an 11-year old boy living in Saskatchewan, Canada, received a very special delivery today of his very own Autism Service Dog from Service Dogs by Warren Retrievers to help assist him and better communicate his needs. Based in Madison, Virginia, Service Dogs by Warren Retrievers, or “SDWR,” has a mission to provide specially-bred and trained dogs for people with invisible disabilities like Diabetes, PTSD, Seizure Disorders, or in the case of Sascha – Autism Spectrum Disorder. SDWR has hundreds of service dogs working across the US and around the globe. SDWR is currently serving approximately 1,000 families. Sandy, a Goldendoodle Autism Service Dog, recently graduated from SDWR’s Service Dog Raiser Program where volunteers diligently raise puppies in training for over the course of approximately one year. Both the dogs and raisers must complete the foundation and skill set training provided through SDWR trainers at their facility in Virginia. Sandy is also an honored graduate of the SDWR Fallen Officer Puppy Program. The Fallen Officer Puppy Program, also known as “FOPP,” is an initiative by SDWR to pay respect to the legacy of service by fallen American police who sacrificed their lives in the line of duty. Sandy is named in honor of fallen hero Master Corporal Sandra Elizabeth “Sandy” Rogers of Aiken Department of Public Safety in South Carolina who was shot and killed while responding to a call for a suspicious vehicle in 2012. Sandy’s work as an Autism Service Dog with Sascha will carry on in memoriam of Master Corporal Rogers’s life of service before self. Sascha was diagnosed with Smith-Magenis Syndrome at the age of 5-years-old. Sascha’s disability affects his and his family's daily life in many ways. They do not go out as often as a family because any kind of transition is rough for him to cope with. His behaviors will get out of control due to unforeseen circumstances. Sascha has a tendency to fall asleep due to occasions of having low blood pressure and he is often very tired. He has low stamina when playing outside most likely due to severe sleep deprivation. Sascha is intellectually delayed and his family is hopeful that a service dog will act as a guardian for him. Sascha’s lack of communication and language skills also prove to be a big challenge for their family. Sascha’s family is hopeful that with the arrival of Sandy it will help keep him focused and encourage him to pay better attention to his surroundings. Sandy will assist in reducing the effects each diagnosis has on the family’s independence and daily life by working continuously with Sascha. Since Sandy is a service dog and covered under laws in accordance with the Americans with Disabilities Act, he will be able to accompany Sascha and his family everywhere – from private speech lessons, to the park, and even to school. SDWR’s unique training program is what sets them apart from other non-profit service dog organizations. SDWR trainers will continue to return for training sessions with Sascha, his family, and Sandy every 3-4 months over the course of the next 18 months to continue working on Sandy’s customized training, follow up training and training the human to make a successful team and public access certification. 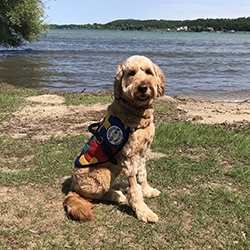 Service Dogs by Warren Retrievers is a nonprofit organization based in Madison, Virginia, and relies on donations to help the organization in its mission, “Until there’s a cure…there’s a dog.” To make or donation or learn more about SDWR, please visit the website, https://www.sdwr.org/. To learn more about Autism Service Dogs go to https://www.sdwr.org/service-dogs/autism/. To find out how you can volunteer as a service dog raiser visit https://www.sdwr.org/service-dog-raiser-program/.